When you’re not a blue blood program in college basketball, you’ll use every recruiting tool you can get in order to help you land some of the premier talent at your school. And luckily for Rick Barnes and Tennessee, Barnes has a pretty good recruiting advantage at his disposal. And it’s a completely legal one that won’t have the FBI knocking at UT’s door any time soon. Barnes was spotted sitting next to a former player of his when he used to coach at Texas while he and his staff were evaluating two of their top targets in the 2019 class on Friday. 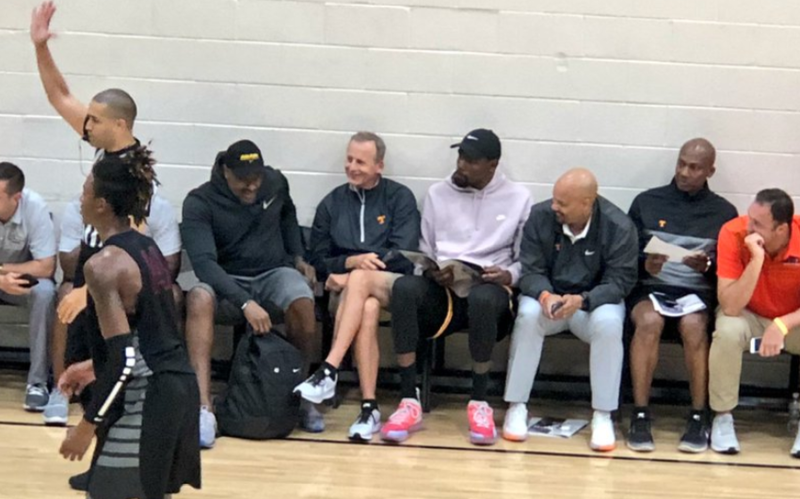 But it wasn’t just any old former player; Barnes was sitting next to NBA superstar Kevin Durant. Durant played for Texas during the 2006-07 season while Barnes was still the head coach of the Longhorns. Durant averaged 25.8 points, 11.1 rebounds, and shot 40.4 percent from three as a 6-foot-9 forward in his freshman year. He was drafted No. 2 overall by the Seattle Supersonics (now the Oklahoma City Thunder) in the 2007 NBA Draft. He’s a two-time NBA Champion, two-time NBA Finals MVP, the 2014 NBA MVP, a nine-time NBA All-Star, and a four-time NBA scoring champion. Barnes and associate head coach Rob Lanier and assistant Desmond Oliver were in attendance to watch a game between Bluff City Legends and E1T1 in a summer league match-up. The game featured two of the Vols’ top targets in the 2019 class, four-star point guard Tre Mann and four-star forward C.J. Walker. The July live evaluation period opened up on Wednesday at 5 PM, and Barnes and his staff have been on the recruiting trail ever since. Mann and Walker are arguably the Vols’ top two targets in this recruiting cycle aside from five-star Josiah James. But Tennessee is in a much better spot with both Mann and Walker than they are with James. Mann, the No. 31 overall player and No. 4 point guard in the 2019 class according to the 247Sports Composite rankings, recently announced he would be making his college decision on July 30th. Tennessee, Florida, and Kansas are his top three teams he’ll be choosing from. The Vols are believed to have a slight edge in his recruitment, but the talented point guard from The Villages, Florida has liked what he’s seen from the Gators as well. He’s officially visited both UT and Florida but hasn’t taken an official visit to Kansas. Walker and Mann are good friends and could possibly be a package deal in the 2019 cycle. The Vols have been high on Walker for a while, and that was even before his recruitment exploded. Tennessee offered Walker back on April 30th, and he’s seen a number of offers roll in since then. He’s added offers from Tennessee, LSU, Xavier, Arkansas, Texas A&M, Georgia, Oregon, Memphis, Providence, and N.C. State all within the last 95 days. Right now, the 6-foot-8, 200-pound Walker is rated as the No. 56 overall player and No. 12 power forward in the 2019 class. But Jerry Meyer, the director of basketball scouting for 247Sports, says if it were up to him Walker would be a top-10 overall player in the country. C.J. Walker is next, next level. Would take work to over rank him. Tennessee currently has two players committed in their 2019 class. Three-star forward and local standout from Bearden High School Drew Pember and three-star forward Davonte Gaines from New York are the Vols’ two commitments in the 2019 cycle.